The hot summer is over, and the fresh autumn air fills our lungs. The colors of nature have begun to change over in the autumn’s rich color range, and the northern lights are back and flickers over the sky during clear nights. Now in the autumn we train the huskies so that they are in good shape for all winter adventures and we are also working on a brand-new website that we hope to launch in the near future. Meanwhile, you will have to keep up with this site, but all our dog sledding adventures for the coming winter season is up to date and are open for booking. Don’t hesitate to contact us if you have any kind of questions about our tours! 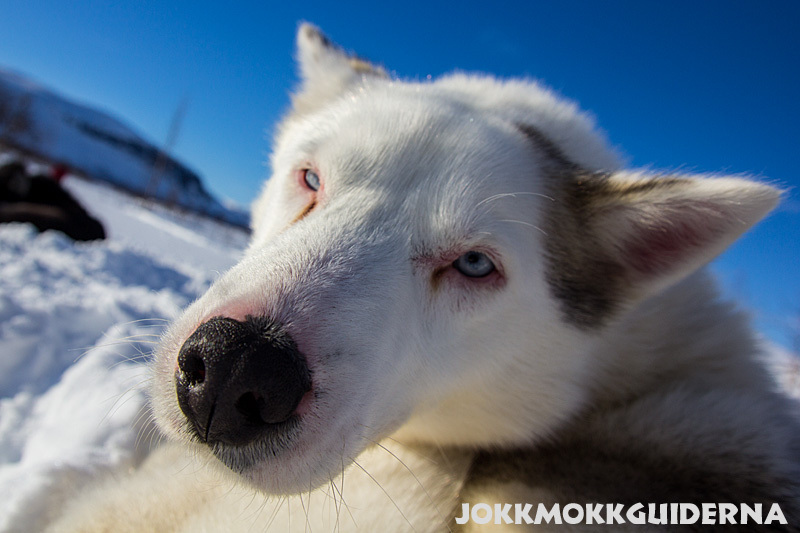 Publicerad: 26 May, 2017 i Aktuellt, sled dog tours. 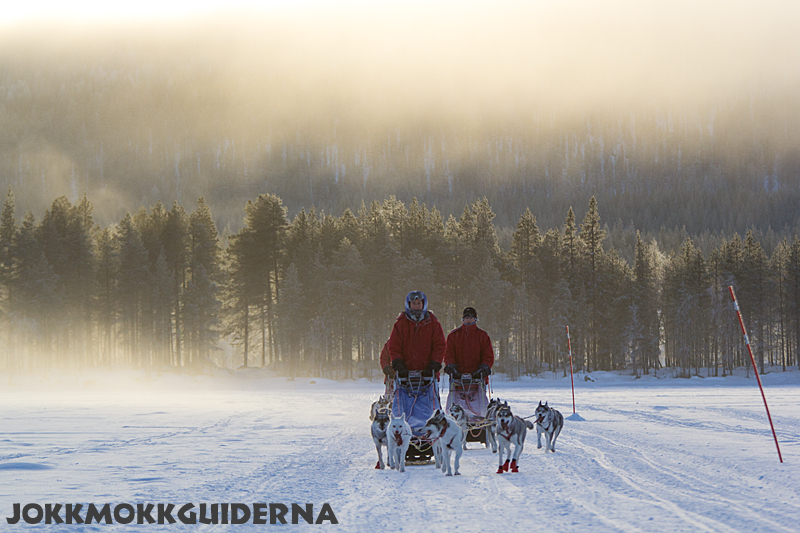 Dream away to the white snowy expanses and imagine the wind on your cheeks when you stand behind the sled after a bunch of happy Siberian huskies. 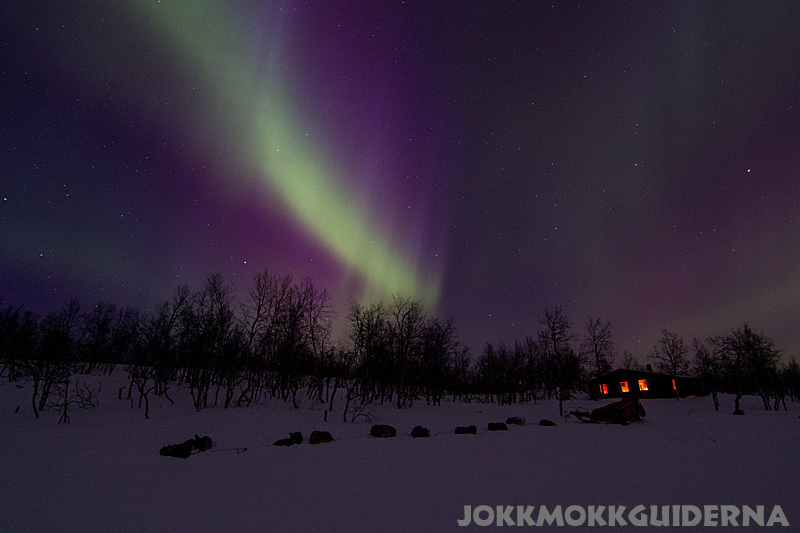 Here is a video from one of our tours called Crossing Lapland with dog sled. Although the film was shot in 2009 is just as relevant today. 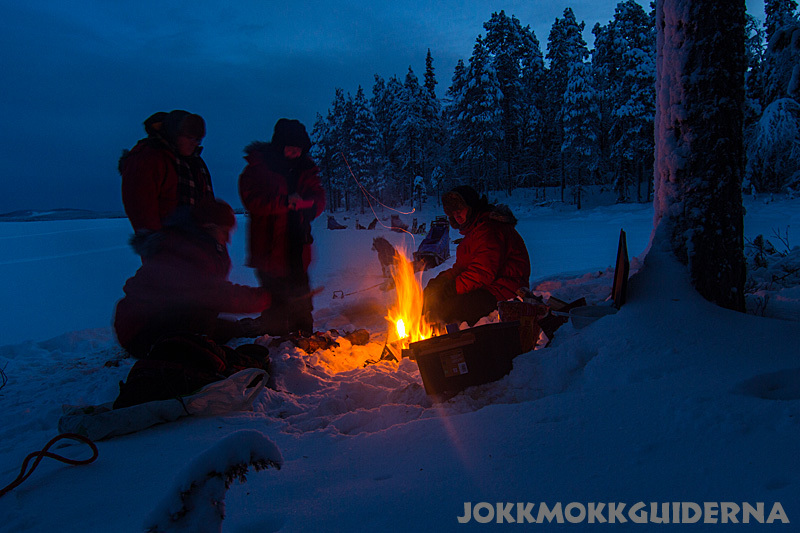 The tour is the first of our week-long mountain tours in early spring winter and starts out from our kennel in Jokkmokk and ends at Saltoluokta Mountain Station. 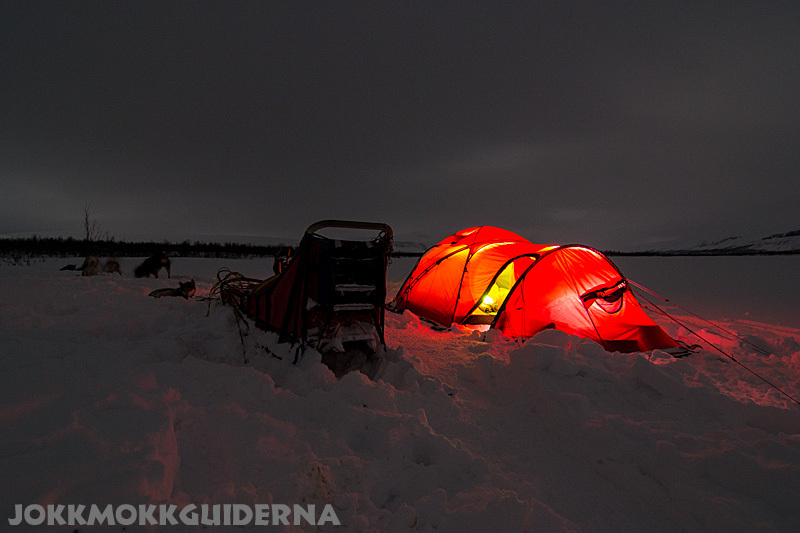 On the tour we travel through the entire spectrum of Lapland from deep forests across frozen lakes, birch forests and up on the bare mountain above the tree line. 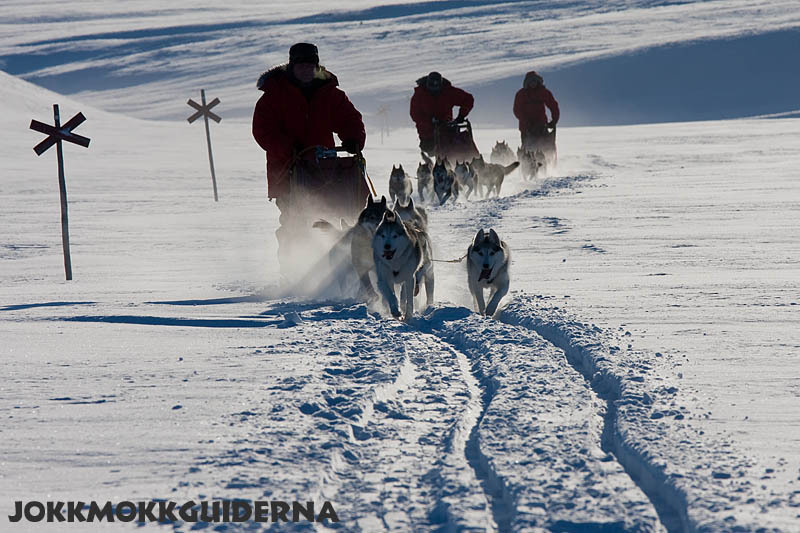 If you want to know more about all the adventures then take a look at our dog sledding tours and do not hesitate to contact us if you have any questions. 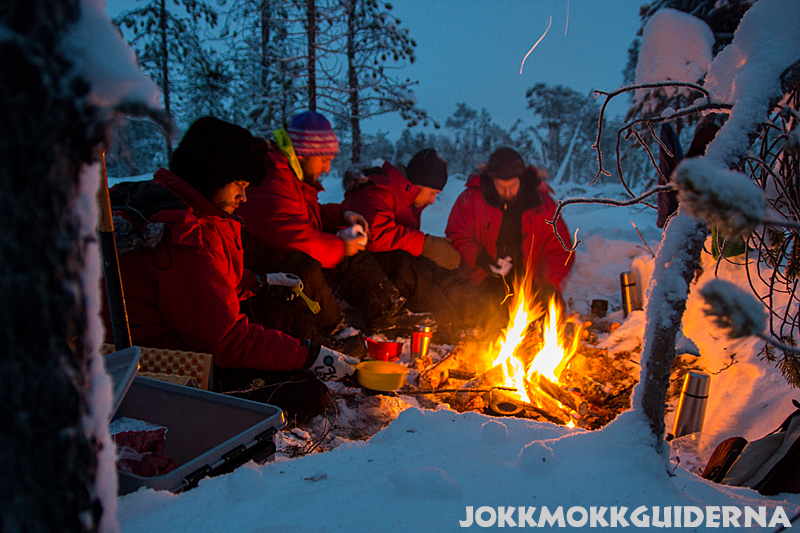 Welcome to Lapland and Jokkmokk! Once again we can look back on a wonderful winter season! 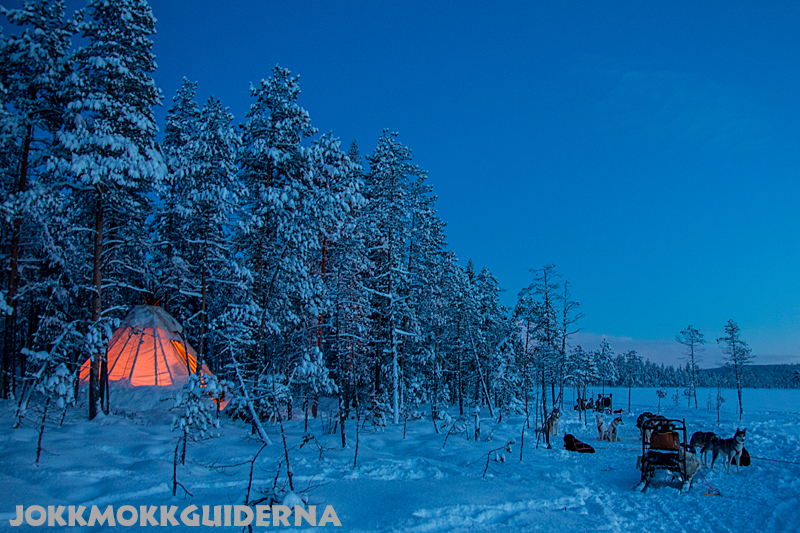 Lapland has once again delivered a winter full of snow with sparkling northern lights, cold, storms, quiet starry nights, sunshine, blue sky and much more. 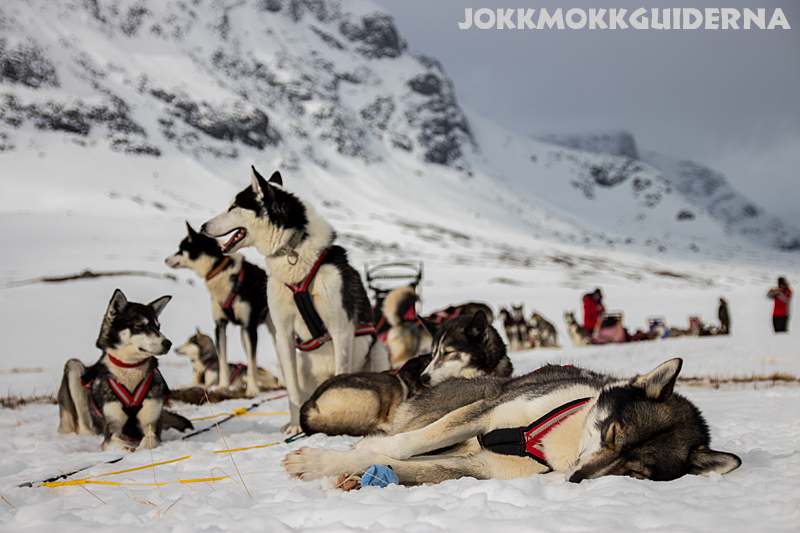 Our huskies are closest to our hearts and they have as always helped us in the best way to carry out with the tours. All our partners in terms of accommodation facilities, taxi drivers, guides and all the people in the village who meet our guests have basically all been spot on examples of good hosting. Last but not least, a big thanks to all our super nice guests who contributed to all the fun we have had together. 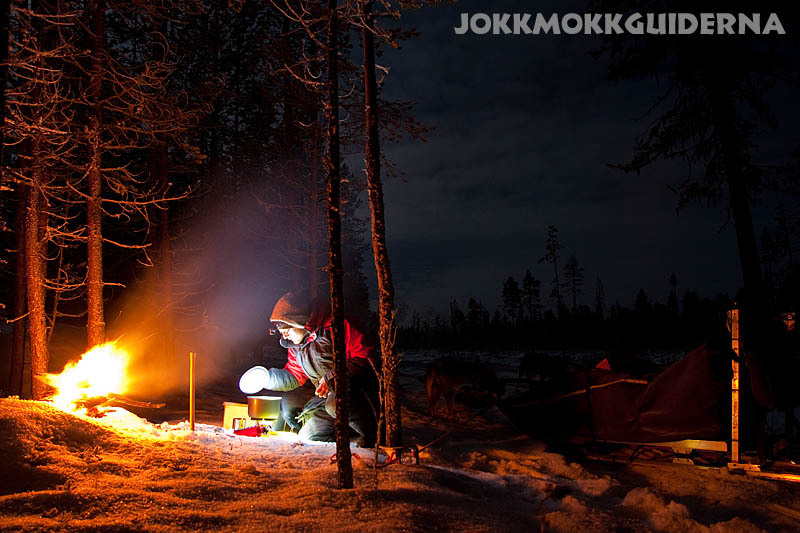 In the Jokkmokk mountains, we still have snow until the end of May. After a full season with dog sledding we do not feel that we have had enough. We will continue to go sledding as long as it is possible. 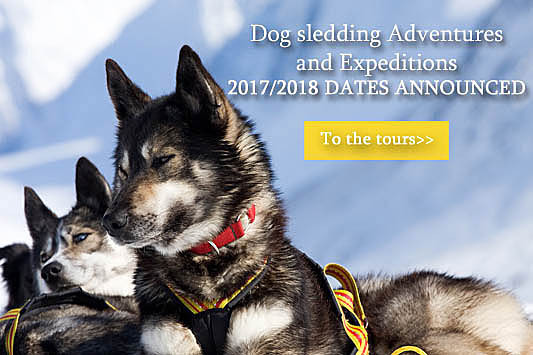 We are currently in the planning of the winter season 2015/2016 and all dog sledding tours will be updated shortly with new dates, so keep an eye on this website. We are already excited, and this season is not even over. Autumn training of our Siberian huskies are in full swing since the beginning of August. The dogs are harnessed in front of quads which they pull. 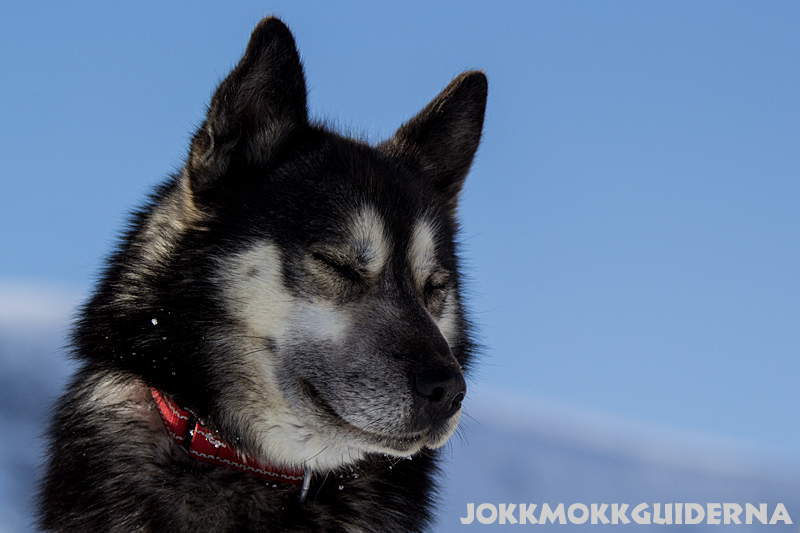 The sleddogs happiness to start working again after the summer break can not be mistaken. They are as eager and enthusiastic as we are. As the temperature drops, we increase the distances on the training tours. Very soon we can feel how the strength of the dog team increases, and the dogs’ stamina gets better with each passing week. Are you keen to join us and our huskies on one of the dog sledding tour this winter, please send us an email. Sometimes the answer is delayed a bit but then you’ll know that it’s because we’re out there and training our four-legged friends. 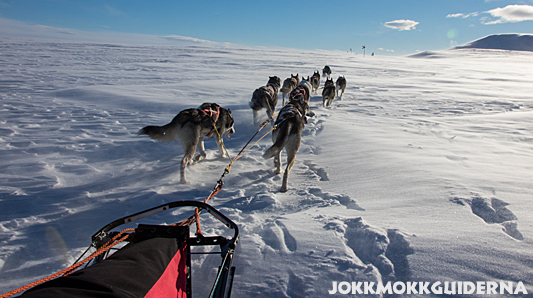 Publicerad: 17 October, 2014 i Sleddog. The German DW Deutsche Welle came to us for a visit in November. They were filming a feature about Swedish Ecotourism for their series Fair Lifestyle – Travel. 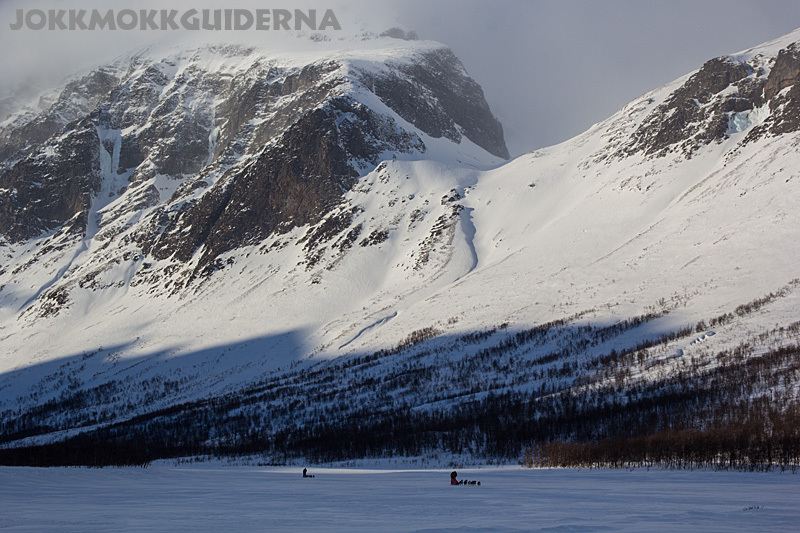 Stina was out on an Overnight tour with dog sled at the time together with Hilde and Simon from Belgium. Matti and the DW reporter joined on day two for filming and interviews. The Awareness of ecotourism and responsible travel is increasing and more and more people are looking to eco-certified tour operators when choosing their holiday. Jokkmokkguiderna is an approved Nature´s Best operator since 2003. The Nature’s Best labels tour operators who go the extra mile for their landscape, local people, the environment and most importantly for you as a customer. Welcome to take a peek into our life! 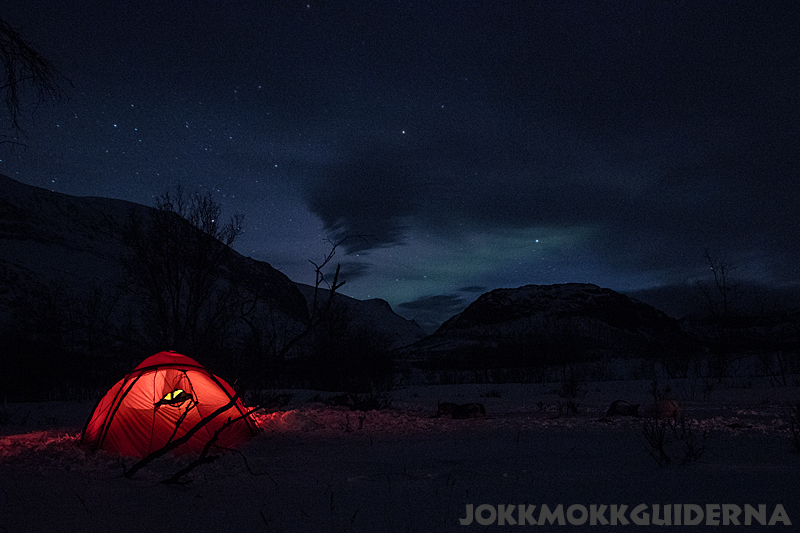 Publicerad: 21 January, 2014 i Aktuellt, Ecotourism, Overnight tour, Television. In a few months, winter is here! A nice summer is coming to an end and in a few months winter is here with crystal white snow, crisp air and northern lights dancing over the sky. 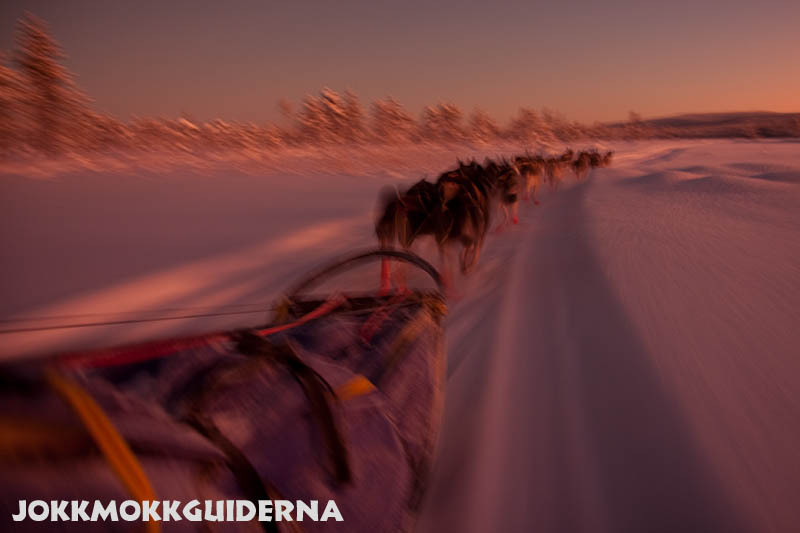 Thinking about standing on the dog sled behind a happy and well trained dog team always makes us long for the dog sledding season. 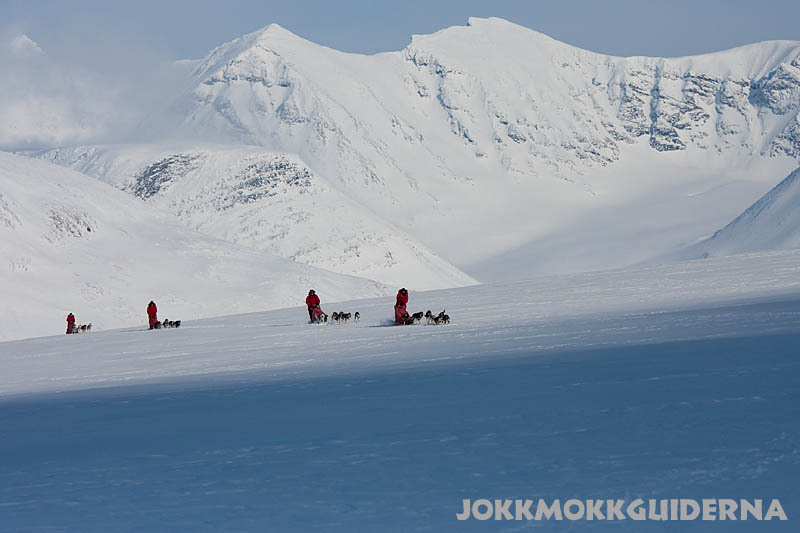 Since beginning of June all our dog sledding tours are updated and we already have some bookings on the longer dogsledding adventures and expeditions. 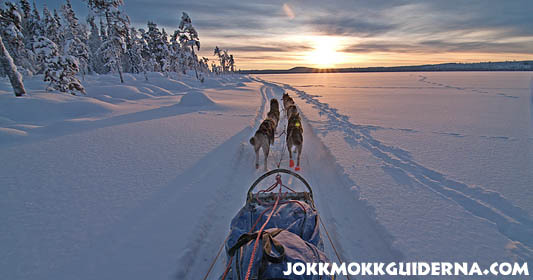 We also offer short dog sled tours which is a great way to get a taste of mushing. These shorter tours from 1 hour up to 2 days are booked upon request. To get a glimpse of what it’s like on our adventures with the huskies you will find lots of photos in our gallery and we also have some inspiring videos. Don’t hesitate to contact us if you have any wonderings! Publicerad: 7 August, 2013 i Aktuellt. Soon we can sum up yet another fine winter season. For our part a really good season from several angles. Lots of bookings, fantastic tours and last but not least very nice guests as usual. Now in the end of the winter season we can conclude that the dogs are doing well and are in really good shape as they have been the whole winter. Probably they would like to run in front of the sleds for a couple of months more. But, the snow will soon disappear and the summer heat is coming so our four legged friends will get a few months of rest during the warmest period. 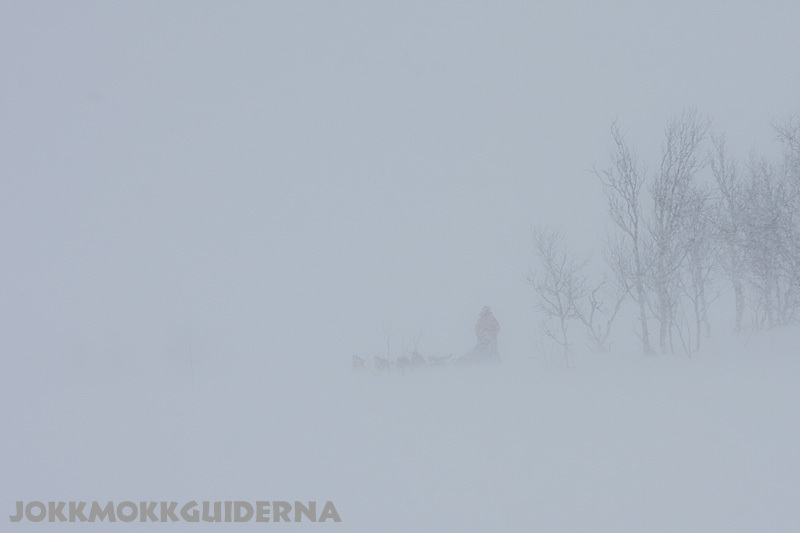 However, we will continue to go dog sledding as long as the snow conditions is good!